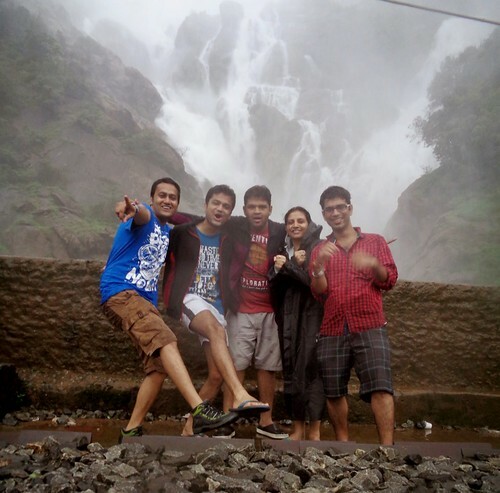 Dudhsagar Waterfalls Trek: Of rains, greens and new friends! As I sit at my desk and enjoy a sumptuous meal, the Sun beats down outside and I drown myself in the memories of an episode where we had forgotten what it meant to be dry or have a good meal anymore for 2 days! An episode on which we were very cold and shivering, wet and hungry, yet happy, loud and wide awake – The Dudhsagar Waterfalls trek. 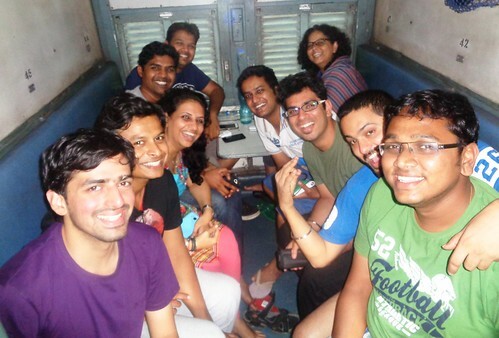 On board the train headed to Goa from Hyderabad, we were a group of 35 trekkers meeting for the first time, but it hardly took any time to connect with fellows with similar passion. You can guess what followed the preliminary introductions. We, the self claimed professionals on all the different card games or Mafia or Uno and what not were bent upon to win and add these victories to our existing laurels. Needless to say, the periodic reminders of fellow passengers to be quiet or sleep were quite in vain. But, we did sleep for few hours before dawn to refresh ourselves for the trek. “Gear yourselves, we alight in 15 minutes”, said our organizer and the rain coats and ponchos were out of the bags and adorned on us in no time. We got down at the CastleRock railway station and some more ponchos made out of polythene were bought and worn. It was raining lightly and we gathered in a circle to hear from our organizers. “Watch out for the trains on the rail track while walking, the camping tents are to be carried in turns and the first aid kit is with the team, in case you need it”, were some of the instructions we were told before we began. There was mild wind and light rain making the weather just awesome before a trek. 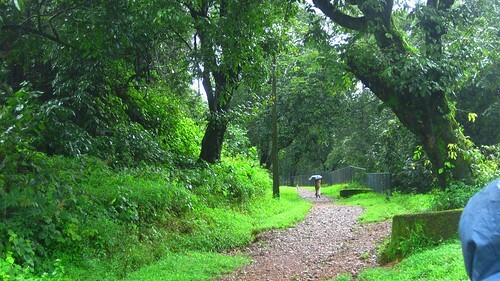 The greenery, dense and radiant clearly stood witness of a good monsoon season. In the distance, clouds floated about the mountains. And in the middle of it all, a railway track went disappearing behind the curves. Our job was one and simple – Follow the track. For 14 kms. We looked excited and entranced. Amidst the chit- chatting, jokes cracking, tents picking, rain proofing and photo clicking, we started out. Hardly some distance in, equations changed. The clouds growled out loud and it started to rain cats, dogs and elephants. From then on, it didn’t stop to rain for a major part of the trek and neither did we. We walked and interacted more. Several walking groups had been formed by then- the fast walkers, the nature admirers, photographers and the slow coping ones – quite far from each other and quite hungry. We had other snacks we had been saving for later. We savored biscuits and bhujiya, paranthas and glucose with wet hands and while getting drenched in rains. All the efforts to keep ourselves dry had been wasted and water had managed to seep all the way in. Soon, it started to become dark and much foggy though the time was hardly 3 pm. We crossed several tunnels (as long as 650m) and bridges and waterfalls and beautiful scenic spots. Trains went past us many a times and the passengers wore curious looks on sighting us. We walked for hours and got tired, but the want to stop was lacking as our bodies were wet and needed to change. Same spot. From clear to foggy in less than 5 minutes! Slowly, with time, we did arrive at our destination. 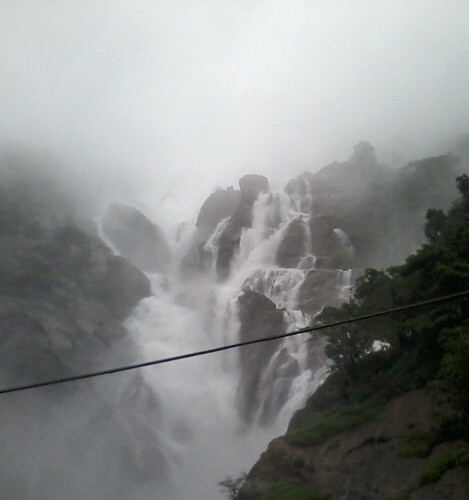 Dudhsagar waterfalls from the first view itself was gigantic! 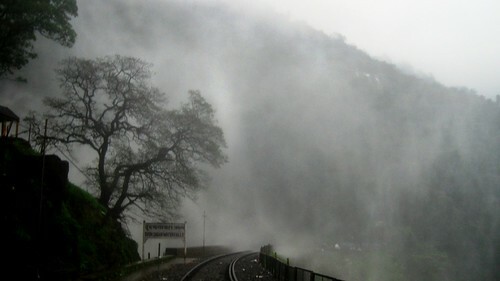 ‘Dudh’ in Hindi stands for milk and exactly that- white colored- waterfalls fell from a great height splashing on the puny rail bridge which passes in front of it. On a small flat ground near the falls, lots of tents were placed, and we also managed to find place to pitch some tents. Ahh, what a relief it was to get rid of our backpacks! It was getting dark by the minute and a few of us went on the rail bridge in front of the freezing cold falls and shouted songs on top of our voice and danced like drunkards! Ohh, what a priceless moment! I returned thus speechless, quite literally. My voice kept on going and I almost lost it in some hours. I had to spend the remaining 2 days using the sign language or a deep growling sound. 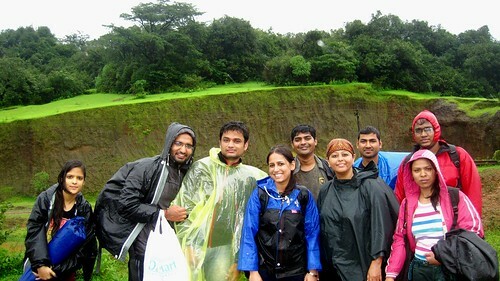 Prefer going with a group and during or post monsoon as the weather is at its best. 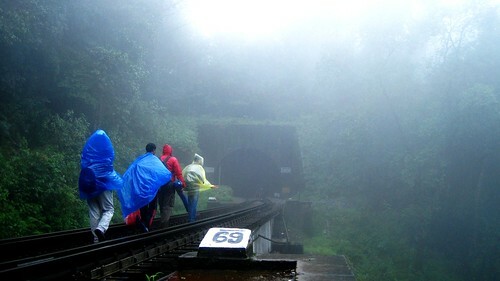 Finding trail is easy- get down at Castlerock or Caranzole Station and walk towards Dudhsagar Falls(14 kms or 7kms). Be prepared to get wet and pack your clothes in polybags before packing in bag. You can camp just near the falls. Don’t forget to take torches, the tunnels are long and dark. Luckily, a shop vendor was selling tea and omlettes there and having cooked food after a long while was just awesome! Then more random talking began till late in the night. A different environment that was: sharing ghost stories sitting around a torch light in an abandoned wooden settlement which had broken floor at places to quickly dispatch you to ground floor from the first. Early morning following day, we were up and went for a few clicks by the waterfalls and started our journey back. We had a 4 hour stop at ‘Londa’ junction where we explored the small town, it’s market, it’s church and it’s sweets. Neha and Degant bought new and ‘shiny’ clothes as their ‘waterproof’ bags did no good. On the way back, Atul and Haider shared many ‘interesting’ stories from school times and Pragya found partners to speak Bhojpuri with. We slept for most of time and played Dumb Charades for I could not speak still. Good people! By the time we reached our homes, some of us had got new nicknames, some had lost their shoes, some the voices and all had gained many new friends and made a lot of memories! For more pictures from the trek, please visit my page here. Wow. Now that’s a real Dudhsagar Experience. Going green from envy. This destination is still pending in my to-do list. Das anna, you can reach to the falls with the bike, but it includes extreme off-roading through forest and crossing streams at times, and the tricky part is finding the trail. Another option is to go in jeep or chauffeur driven bikes. Fellow biker Rohit Upadhyay (Biru) & group has already done it. Thanks for sharing the information Rajiv. Hahah. My voice is back and I can scream, very well I can. 😀 Do visit Dudhsagar, it’s a different experience. I have been wanting to go there for soooo long! Thanks. Dudhsagar is amazing, go for it…! Looks like you all had a great time! The place is beautiful from what I can see. You did that trek through the railway track!! Thumbs up! I’m sure the Chai and omelette really re-fuelled you. Nice pics. Love the inside-the-tunnel one!! Wonderful Jatin, this is something I have wanted to do for quite sometime now, during the monsoons!! Was your’s a self-organized group or through a trekking company? Do share this info. Also, when you say 14 kms or 7kms, what do you mean? Do you mean there are two trails that lead to the falls? One better than the other? 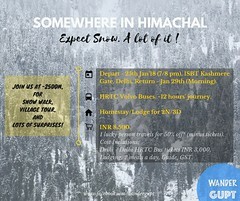 This trip was organized by an adventure company based in Hyd, but you can easily do it yourself as well. I met many folks there who were doing this by themselves. About the 14 kms and 7 kms trails, they are same and on the one and only track. Just that one is shorter than the other. If you start the trek from Castlerock, 7kms later, Caranzole station comes on the stretch. 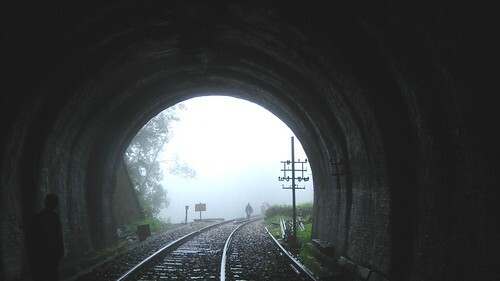 wonderfull Jatin, This post is very helpfull to me, Now me and my friends are planing to go dhudhsagar from pune, and we want to stay there at night so could u please help me out, I means do i have to bring tent from pune? Or can i get tent in castle rock? Hi Rupesh, thanks for writing, am glad the post could help you out! 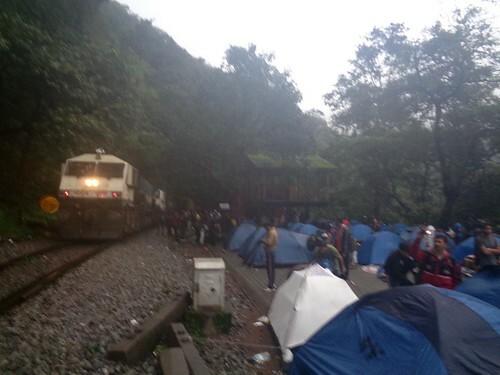 If you wanna stay out there at Dudhsagar falls, you will have to get your own tents from Pune itself, there are no provisions there except for a small tea shop which is not always open. If you do not have tents, you can also buy a tarp and lie on it and cover yourself in it (cheaper formula if you don’t wana buy tents just for this trip 😉 ), tarp is always good.